'I was introduced to the gospel of Jesus Christ as a college student. The Jesus of the New Testament overwhelmed me, and by God's grace Jesus still does,' writes professor Robbie Castleman, author of New Testament Essentials. Her love of Jesus and Scripture is evident in this study, which seeks to answer the question Jesus' disciples posed: 'What kind of man is this?' (Matthew 8:27). New Testament Essentials introduces us to the New Testament in three parts: The revelation of God in Jesus Christ, the indwelling of God in the church by the Holy Spirit and the present and coming kingdom of God. In each of the twelve studies the author helps us to hear Scripture in its own historical and cultural context before guiding us to apply it to our own context. Jesus' life, teachings and works were thoroughly grounded in the Hebrew Scriptures. And so each session includes a special feature called 'Connecting to the Old Testament.' Through this you will begin to discover the links between the two testaments and gain a fuller sense of our unfolding salvation history. 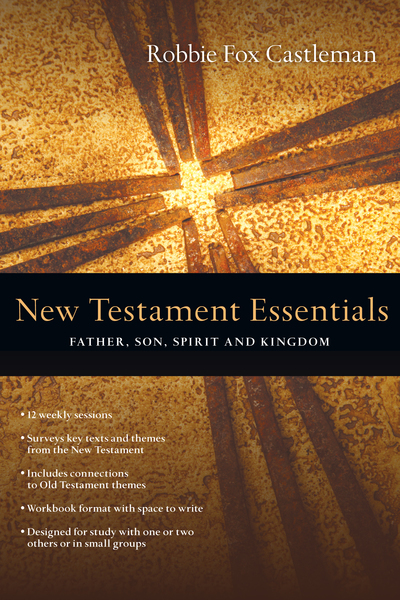 Following a format similar to the other volumes of the Essentials series, each of the 12 sessions includes the following elements: A memory verse A Bible study A reading A life application section 'Connecting to the Old Testament' feature Designed to work well on your own, with a partner or in a small group, New Testament Essentials offers a comprehensive overview that will enrich your knowledge and deepen your faith.